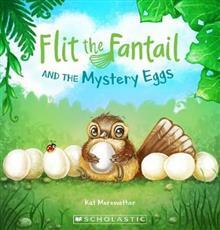 Flit has found some eggs ... but whose could they be? It is a misty morning in the forest. Flit the fantail chick is practising his landings. Flap, flop, slip, FLIP. Flit slips on something slippery and round. He has stumbled upon eight rubbery white eggs. Join Flit and his friends, Kiki the kaka, rascally robins Bit and Bob, Keri the kiwi and wise old Ruru as they exercise some teamwork. Can they figure out who the mystery eggs belong to?